Surya Bahadur Thapa (Nepali : सूर्य बहादुर थापा; March 21, 1928 – April 15, 2015) was the only Nepali politician a five-time Prime Minister of Nepal. He served under three different kings in a political career lasting more than 50 years. The Rastriya Prajatantra Party is a royalist political party in Nepal. It was formed by former Prime Ministers, Surya Bahadur Thapa and Lokendra Bahadur Chand. The party has had two Prime Ministers, Thapa and Chand, serving two terms each since the end of the Rastriya Panchayat. Panchayat was the political system of Nepal from 1960 to 1990. It was based on the Panchayat system of self-governance historically prevalent in South Asia. Rastriya Janashakti Party is a liberal political party in Nepal, led by former Prime Minister Surya Bahadur Thapa. Thapa had split away from the Rastriya Prajatantra Party in November 2004. The party is registered with the Election Commission of Nepal in March 2005. Surya Bahadur Thapa was born on March 21, 1928, in the village of Muga in Dhankuta district. He began his political career in the underground student movement in 1950. In November 1958, he was elected to the national assembly as an independent, and became Chairman of the Advisory Council. In 1959, Thapa was elected to the Upper House. He was appointed Minister of Agriculture, Forest and Industry under the newly formed Panchayat system. Subsequently, he served as Member of National Legislature and Minister of Finance and Economic Affairs. Dhankuta is a hill town and the headquarter of Koshi Zone located in Dhankuta District of Eastern Nepal. According to 2011 Nepal census, it has population of 26,440 inhabitants. Despite not even standing for election in 1963, Thapa was nominated to the National Panchyat by King Mahendra and was appointed chair of the Council of Ministers and Minister of Finance, Law, Justice and General Administration. During this period he was instrumental in abolishing "Land-Birta-System" and set strategies to promote land reform by consolidating tenancy rights of the tenants. Thapa was responsible for "Muluki-Ain", through which he attempted to eradicate the practice of an untouchable caste and promote women's suffrage, among other social activism. 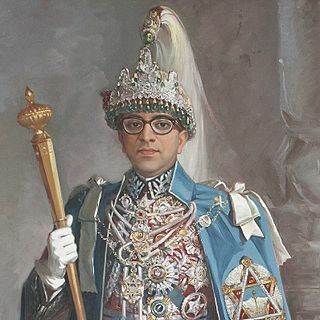 Mahendra Bir Bikram Shah Dev was King of Nepal from 1955 to 1972.Mahendra was born 11 June 1920 to King Tribhuvan Bir Bikram Shah of Nepal. Although Tribhuvan was nominally king since 1911. Mahendra was captive in Narayanhity Royal Palace, virtually a gilded cage. In 1940 he married Indra Rajya Lakshmi Devi, daughter of General Hari Shamsher Rana. Mahendra had 4 sons, Ravindra - from "Geeta Gurung", Birendra, Gyanendra, Dhirendra and three daughters Shanti, Sharada, and Shobha. Crown Princess Indra died in 1950. In 1952, Mahendra married Indra's younger sister, Ratna Rajya Lakshmi Devi. This marriage produced no children. The Communist Party of Nepal was one of the two major communist parties in Nepal. The party was formed in January 1991 with the unification of the Communist Party of Nepal (Marxist) and the Communist Party of Nepal (Marxist–Leninist). It has led four governments: from 1994 to 1995 under Man Mohan Adhikari, from 2009 to 2011 under Madhav Kumar Nepal, in 2011 under Jhala Nath Khanal, and from 2015 to 2016 under Khadga Prasad Oli. The party was also a junior partner in five coalition governments: in 1997 under Lokendra Bahadur Chand, from 1998 to 1999 under Girija Prasad Koirala, from 2008 to 2009 under Pushpa Kamal Dahal, from 2011 to 2013 under Baburam Bhattarai, and from 2014 to 2015 under Sushil Koirala. It dissolved on 17 May 2018 to make way for the Nepal Communist Party in a merger with the Communist Party of Nepal. Rashtriya Prajatantra Party-Chand was a Nepalese political party. It was a right-wing pro-monarchy party, formed out of the political elite of the erstwhile Panchayat system. Rastriya Janamukti Partry is a political party in Nepal. The party was founded on 6 May 1990 as Nepal Rastriya Janamukti Morcha. After unification with Rastriya Jana Party on 20 January 1992, the unified party adopted the name, Rastriya Janamukti Party. Rastriya Prajatantra Party Nepal was a Hindu right-wing, cultural conservative and royalist political party in Nepal. Renu Kumari Yadav is a Nepalese politician, belonging to the Ahir community, who was appointed as the Minister of Education in 2008. She is a member of the Madhesi Janadhikar Forum. Samyukta Samabeshi Morcha is a coalition of political parties formed ahead of the 2008 Constituent Assembly election in Nepal. The coalition comprises the Rastriya Janshakti Party, Nepali Rastriya Janabhavana Party, Rastriya Janamukti Party and Rastriya Jana Ekta Party. Hari Bahadur Basnet is a Nepalese politician. He is the head of the Foreign Relations Department of the Rastriya Janashakti Party. Basnet holds a M.Sc. in Engineering. Jog Meher Shrestha is a Nepalese politician, belonging to the Rastriya Prajatantra Party. He was politically active during the Panchayat period. Shrestha was appointed Land Reform and Management Minister in the cabinet of Sher Bahadur Deuba in 2004. Kamal Thapa served as a Deputy Prime Minister and Federal Affairs and Local Development Minister of Nepal Government. He is also current president of Nepal's royalist party, the Rastriya Prajatantra Party. He served as a Home Minister during King Gyanendra's direct rule in 2006 until the king was forced to handover power to Girija Prasad Koirala of the Nepali Congress Party and his allies with Communist Party of Nepal and Unified Communist Party of Nepal (Maoist). He and his party called for a re-establishment of the monarchy through a referendum vote. Thapa claims that no political parties in Nepal have the courage to safeguard Nepali nationality, claiming: "Now the onus lies only with the institution of monarchy to safeguard Nepali sovereignty and national unity." Balaram Gharti Magar is a political leader of Nepal. He became minister 11 times in the past, during Panchayat System, and after the declaration of multi party system. Roughly, he remained in different governments as a minister for about 30 years in the past. He is a Central Committee Member, Senior Member, of Rastriya Prajatantra Party (RPP). He is still actively taking part in his party activities. He has been visiting his birthplace, Rolpa, and Rolpali people time to time. Rekha Thapa is a Nepali actress, model and film maker. She was a top ten finalist for Miss Nepal in 1999. Two years later she made her movie debut in Chhabiraj Ojha's Hero. She has worked in around 200 Nepali movies and has gained popularity in the Nepali cine world because of her glamorous role. She owns the movie production house Rekha Entertainment. She won the CG Digital Film Awards for Best Actress, and in 2011 she has also won the NEFTA Film Awards for Best Actress. Sunil Bahadur Thapa is a Nepali Politician who is currently serving as Ministry of Industry (Nepal). He is the son of five time prime minister of Nepal, Surya Bahadur Thapa. He has recently won in the Constituent Assembly of Nepal. The revolution of 1951 in Nepal, also referred to as Sat Salko Kranti, was a political movement against the direct rule by the Rana dynasty of Nepal. It marks the beginning of the political awakening and democratic movements in Nepal, and resulted in immediate abolition of the institutionalized hereditary Prime Minister system in Nepal. The Nepal Loktantrik Forum was a political party in Nepal. The party was established on April 5th, 2017, after merging with the Madheshi Jana Adhikar Forum (Democratic), the Rastriya Janamukti Party (Democratic), and the Dalit Janajati Party. Legislative elections were held in Nepal in two phases on 26 November and 7 December 2017 to elect the 275 members of the fourth House of Representatives, the lower house of the Federal Parliament of Nepal. The election was held alongside the first provincial elections for the seven provincial assemblies. A political deadlock between the governing Nepali Congress and the winning left-wing coalition over the system used to elect the upper house led to delay in forming the new government. Following the announcement of final result by the Election Commission, K.P. Oli of Communist Party of Nepal was sworn in as Prime Minister on 15 February 2018 by the President according to Article 76 (2) of the constitution. He passed a Motion of Confidence on 11 March 2018 with 208 votes. Rastriya Prajantantra Party (Prajatantrik) is a political party in Nepal. It was formed on 6 August 2017 by Pashupati SJB Rana after splitting from Rastriya Prajatantra Party. ↑ "Welcome to Frontline : Vol. 29 :: No. 16". Hinduonnet.com. Archived from the original on 2011-06-06. Retrieved 2012-08-18. 1 2 3 Pokhrel, Rajan; Koirala, Keshav (April 16, 2015). "Five-time PM Surya Bahadur Thapa passes away" . Retrieved April 16, 2015. ↑ Bhuwan Lal Joshi & Leo E. Rose (1966). "Democratic Innovations in Nepal: A Case Study of Political Acculturation". University of California Press. p. 223. Retrieved 2015-04-16. ↑ Bhuwan Lal Joshi & Leo E. Rose (1966). "Democratic Innovations in Nepal: A Case Study of Political Acculturation". University of California Press. pp. 434–441. Retrieved 2015-04-16. ↑ "Nepalresearch" . Retrieved April 20, 2015. ↑ "YNews!" . Retrieved April 20, 2015. 1 2 3 4 "Nepal (1946-present)". University of Central Arkansas, Department of Political Science. 2013. Retrieved 2015-04-19. 1 2 Ian Preston (2001). "A Political Chronology of Central, South and East Asia". Psychology Press. p. 204. Retrieved 2015-04-19. 1 2 "PM Thapa - A Factual Profile". Nepal Digest. 7 October 1997. Retrieved 21 April 2015. ↑ Harsha Man Maharjan (2012). "Attempted Assassination of Journalist Padam Thakurathi and Its Reporting in Bimarsha on September 12, 1986". nepali media history research collection. Retrieved 2015-04-19. ↑ Michelle Kergoat (2008). "Histoire politique du Népal – Aux origines de l'insurrection maoïste". KARTHALA Editions. p. 130. Retrieved 2015-04-19. ↑ "History of Rastriya Prajatantra Party Nepal". Nepal Rastriya Prajatantra party. Retrieved 2015-04-19. ↑ Claude Rakisits (1997). "Nepal in 1997". Encyclopædia Britannica. Retrieved 2015-04-16. ↑ laude Rakisits (1998). "Nepal in 1998". Encyclopædia Britannica. Retrieved 2015-04-16. ↑ Leo E. Rose (2003). "Nepal in 2003". Encyclopædia Britannica. Retrieved 2015-04-16. ↑ "UNiCEF" . Retrieved April 20, 2015. ↑ "indymedia". Archived from the original on August 24, 2011. Retrieved April 20, 2015. ↑ "ipcs" . Retrieved April 20, 2015. ↑ "SATP" . Retrieved April 20, 2015. ↑ Keshab Poudel (2004). "Nepal in 2004". Encyclopædia Britannica. Retrieved 2015-04-16. ↑ "rppn" . Retrieved April 20, 2015. ↑ "nepaltimes" . Retrieved April 20, 2015. ↑ "telegraphnepal" . Retrieved April 20, 2015. ↑ "wn.com" . Retrieved April 20, 2015. ↑ "RPP-RJP unification process starts today; Thapa to head the party" . Retrieved April 20, 2015. ↑ "ipsnews.net" . Retrieved April 20, 2015. ↑ Ekantipur Staff (16 April 2015). "Ex-PM Thapa dies in Delhi Hospital". Ekantipur.com. Retrieved April 16, 2015. ↑ "Former PM Thapa passes away". Nepal Times.com. Retrieved April 16, 2015. ↑ "Former Nepal PM Surya Bahadur Thapa dies". Times of India. April 16, 2015. Retrieved 2015-04-16.